If you are taking a picture, but are not ready to send it out yet, you can click on the "x" in the upper left. You will be asked if you want to discard the pictures, or back them up to the Kinderlime Cloud. Select "Backup." When you're ready to send the pictures, you would go back to the Photos activity, click on the Gallery icon in the lower left, then select Kinderlime Cloud. There will be an option at the top to see "Unsent" photos. 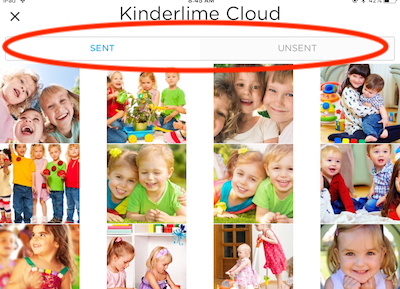 Saving photos to the cloud will allow you to access them again later from the Kinderlime website on the Daily Activity screen. 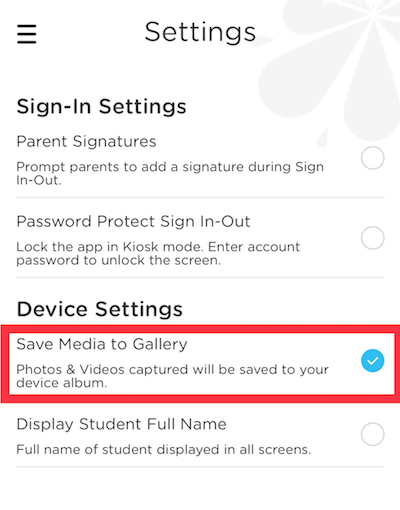 Alternatively, you have the option to save the photos/videos you take with the Kinderlime app to your device's photo gallery. Please note that this will take up space on your device's memory. You can enable this option from the app settings. NOTE: This setting is device-specific, which means that the photos you take on your device will be saved on your device. Photos taken on another device will NOT be saved, unless the setting is also enabled for that device.